The leading light of Frankel's offspring for many. The early declaration stage at 23 entrants still thinking about future plans. A couple of Frankel's may be heading to Newmarket. 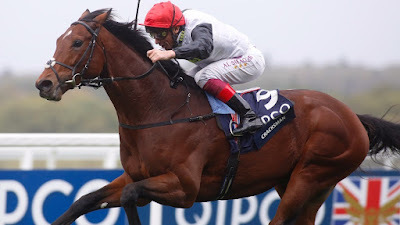 Cracksman needs little introduction as a class horse. This four-year-old bay colt is trained by John Gosden in the ownership of A E Oppenheimer. Just seven runs to his name but a a colt in the shadow of his immense father, like son. Readers may remember his debut win at Newmarket over 1m. A return at 3yo saw him win the Investec Derby Trial by a short head. Made favourite for the Epsom Derby [7/2f] he was denied by one length. Then beaten a neck in the Irish Derby (Group 1) at the Curragh. In truth, losing little in defeat. Then we witnessed three imperious results. York's Great Voltegeur Stakes (Group 2) keeping on strongly to win by six lengths, pushed clear and kept on strongly for Frankie Dettori. Chantilly, France. The Qatar Prix Niel (Group 2). Made 2/5f and winning by three-and-a-half lengths in comfortable style with Dettori at his best. Ascot. Dropping back in distance to 1m 2f taking the Qipco Champion Stakes (Group 1) impressively by seven lengths.